Etsy is a haven for rampant recycling of all sorts of materials--including romance novels. 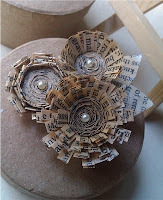 Rebekah Holguin recycled a romance novel (that died a natural death) into this floral brooch. She also has a range of other recycled jewelry. Rebound designs, on the other hand , is the jewelry equivalent to skipping to the good bits. 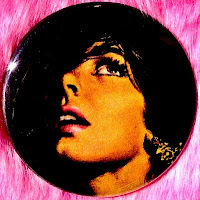 They provide brooches displaying racy excepts from romance novels, begging the question what exactly is the right occasion for a pin that says "probing her damp cleft"? Meagan (a.k.a. FussyGussy) makes pocket mirrors with retro cover backs, such as this one from "Echo In a Dark Wind" by Julia Withers. And for the Nora Roberts ran (who can stand the thought of a hardback book being gutted, there is a purse made from a copy of Three Fates.